I share your high regard for Jimmy Olsen, and not only for issue #133, but for the whole run. The comic book interests me on a number of levels. Evanier has said Kirby did develop ideas for the Superman character. It’s not clear to me if Kirby (as is likely) developed the ideas in response to a request from DC or if he’d developed the ideas on his own before ever coming to DC (which seems unlikely). What ever the case may be, it’s in Jimmy Olsen where we get to see Kirby’s Superman. I love Kirby’s Superman, especially his character, his dialogue. Kirby’s Superman is the “best” Superman seen since the Superman in the first ten issues of Action Comics. My regret is that in the first few issues of JO, it was more than Superman’s face which was being redrawn, it was the whole damn figure. Many panels which should have been classics (including several of Kirby’s extreme foreshortened straight at the viewer flying shots) are castrated by the DC house style. Even worse, the first few issues of JO don’t exist in pencil photocopy form, so all of Kirby’s Superman (as drawn) is lost forever. Just imagine issue #133, page 19, panel four, as drawn by Kirby. Kirby’s Jimmy Olsen was a chance to see Kirby working an assignment. 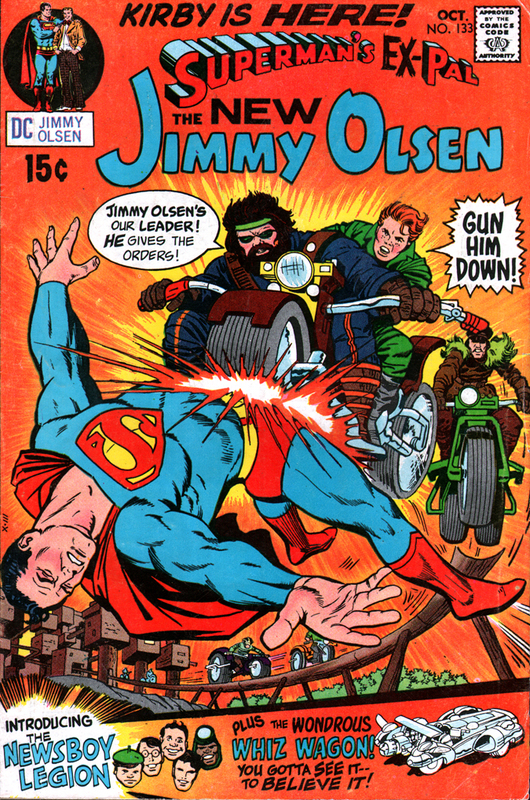 Kirby was able to retain some of the essence of the “classic” Jimmy Olsen, while making the title his own. Olsen as Hell’s Angel, The Giant Green-K Olsen, Goody Rickels, Transilvane, and other aspects captured the funky weirdness of the early ’60s Olsen while being distinctly Kirby creations. The other three “movements” (The Fourth World has an almost symphonic construction) are very different in tone from JO, and JO adds a leavening, a lightness which is absent, or muted in the other three books. From dark to light, I think even the most disinterested reader would see the order as: New Gods, a large step to Mister Miracle, a smaller one to the Forever People, and then another larger step to JO. Kirby had it nailed. The Fourth World has the same structure as a great novel. Each chapter (title) is a part of a whole fabric, which is masterfully constructed. You follow one group of characters for a chapter, and then pick up with another, and while you are eager to get back to the first group, you don’t want to leave the second, and then a third, and fourth group are introduced into the same world, each building on the last with lingering grace notes creating a wonderful harmonious whole. The line “…brought vital energies and artistic sparks to these quaint old lines…” does fit nicely with Kirby’s work on Olsen. One of my earliest encounters with Kirby’s work was when the Fourth World characters appeared on the Super Friends. It had a profound effect on me. It was a world of exotic characters that seemed to be invading the lame world of the Super Friends cartoon, like intruders from another dimension or a much cooler show. That’s kind of how I regard Jimmy Olsen: it’s a crappy comic where Kirby’s universe invades and takes over, an “awesome-carrying” virus. The redrawn faces are part of the lingering lameness of the host body. As much as I like it, I can’t hold Kirby’s Olsen in the same regard as the other three parts of the Fourth World. I don’t think it should be grouped in with them. 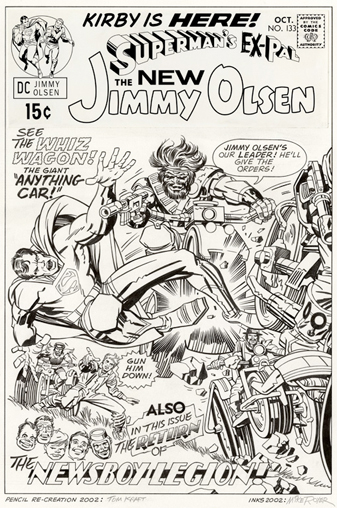 I see Olsen as the mainstream DC comic where Kirby’s concepts make a guest appearance to help draw traffic to the real action in New Gods, Mister Miracle and The Forever People. Those books are a cohesive whole; Olsen is the movie trailer. As great as Kirby’s Olsens are, and this is part of Kirby’s genius, they contain a lot of the themes that the Olsen series had prior to his arrival: Jimmy’s odd temporary transformations, newsroom drama, generational conflicts with his father-figure Superman. I doubt Kirby saw them as integral to the larger myth he was weaving. I think his take on Olsen was how he would’ve liked to have seen DC’s whole line of super-hero comics done, where other writers and artists were free to use the Fourth World as a resource for concept and story ideas to inject into their stories. I can imagine an alternate universe where Kirby was embraced by the DC offices, where 1970s Batman, Wonder Woman, the Green Lantern and the rest of the JLA occasionally tangle with the minions of Darkseid. What would be REALLY cool would be for a writer/artist like TOM SCIOLI to take a crack at the Fourth World, or any of Jack’s other ’70s creations. After all, we’ve had to suffer through thirty years of ineptitude from the so-called “professionals” DC and Marvel have hired to “reinterpret” and “update” Kirby’s stuff, instead of hiring someone who can actually recapture the true spirit and style of the King’s creations in a contemporary version. If it’s POSSIBLE to do the latter, I think Tom is one of the few guys out there who could pull it off, and who should be invited to try. Or is that just asking too much from the editorial dullards running the Big Two? Believe it or not, it was my non-comics-reading wife who taught me the correct pronunciation for “Darkseid” as Dark-SIDE, because she had heard it so as a faithful watcher of the Super Friends cartoon, but, right or wrong, I still persist in pronouncing the evil lord’s name as Dark-SEED. I don’t recall ever being corrected by other comic readers in the ’70s and part of me is probably stubborn because I get riled up thinking of George Lucas swiping Jack’s Fourth World in the Star Wars flicks… Anyway, Dark-SEED sounds cooler! Many of the Fourth World names are very evocative and prove really sturdy under deconstruction. Apokolips is great, but I like the name of Captain Victory’s shattered world, Hellikost, even better. The Kirby nomenclature is one of the seriously very coolest things about his work. He had his own language and we reveled in it, even if sometimes we’d have to virtually decode the oft “quoted” dialogue, can you “dig” it? You are not alone. I couldn’t agree more. Kirby was on top of what he was doing, of course; it was all a matter of intent. Was li’l Harv ever used again by anyone at DC? If not, I got dibs! I love the Tom Kraft/Mike Royer recreation of 133’s alternate cover. Was it the Comic Book Artist Special Edition where the pencils for this originally appeared? Actually, the pencils first appeared in 1979’s Jack Kirby Masterworks! Thanks for mentioning the CBA Special Edition, one of my fave publications ever! It’s got my mom’s picture in it! It’s a nice picture, too. Glad I didn’t misremember seeing that pencil piece in the Comic Book Artist Special Edition, but now that I’ve taken it out I want to re-read it! I only know this because I have the magazine. The alternate cover for Jimmy Olsen #133 first appeared in Graphic Story World #6, July 1972. …not to mention Forever People #1. I love Richard Kyle’s superb ’zines. His Argosy was a splendor, too. I don’t have that particular issue, Mr. Ford. Thanks for the citation and especially Mr. Evanier’s tantalizing commentary therein.